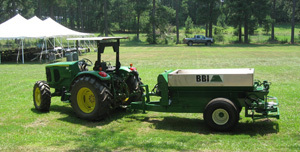 8 ft MagnaSpread Single Axle Granular Fertilizer Lime Spreader with Ag and Turf design. Low Profile - Low Center of Gravity - Pull with a LOW HP Tractor. All BBI MagnaSpread units come equipped with the proprietary BBI Binary Manifold which makes use of all electronics a Snap! Spreads Fertilizer with 80 foot swaths! 16" Mesh Chain, SS Spinners and Fins, Heavy Duty Jack, 12K Rigid Axle, 16.5 Tires, Light Kit, and S6 CV PTO are standard and included in list price.